One of the most surprising facts about House Finches is that they are not native to the Eastern United States. They were originally found only in the western U.S. and Mexico. In the 1940’s, humans intervened, capturing a small group of these birds to sell on Long Island as pets. After the sellers got caught, the finches were released, leading to their eventual expansion. Taking advantage of the friendly habitat, House Finches bred and have since become one of our most populous birds, with an estimated 267 million to 1.4 billion individuals. Their presence is always a welcome addition. Their songs are cheery and melodious and their colors warm and beautiful. The red coloration of the breast and eye-stripe in the males comes from pigments contained in their diet, which consists of nuts and seeds. House Finches dine enthusiastically on dandelion seeds, their bright red plumage contrasting against the yellow blooms – a cheery sight indeed! Females prefer to mate with the brightest, reddest males. Females are much less conspicuous, an overall gray-brown color with indistinct streaks. 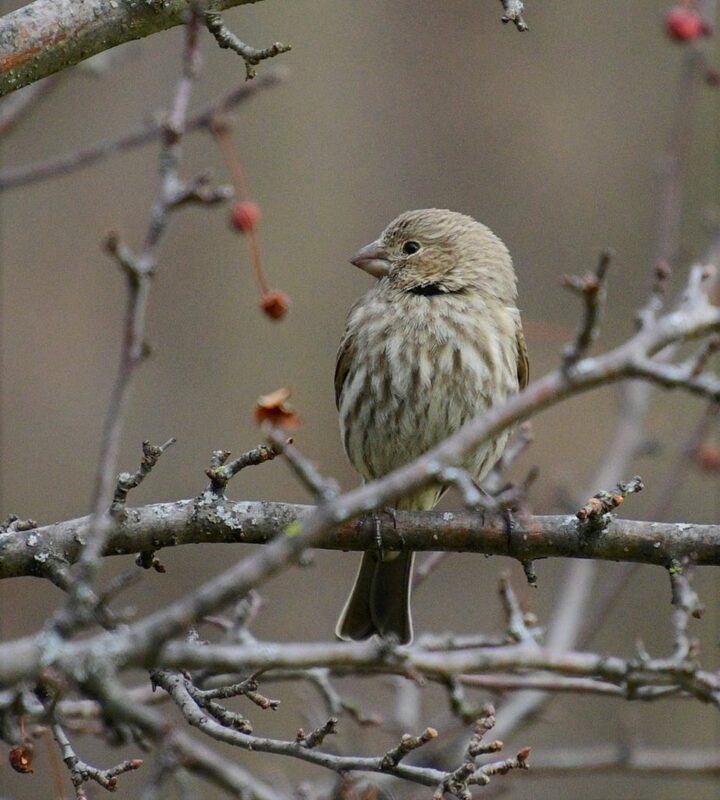 According to bird banding data, the oldest known living House Finch was a female, reaching 11 years and 7 months. 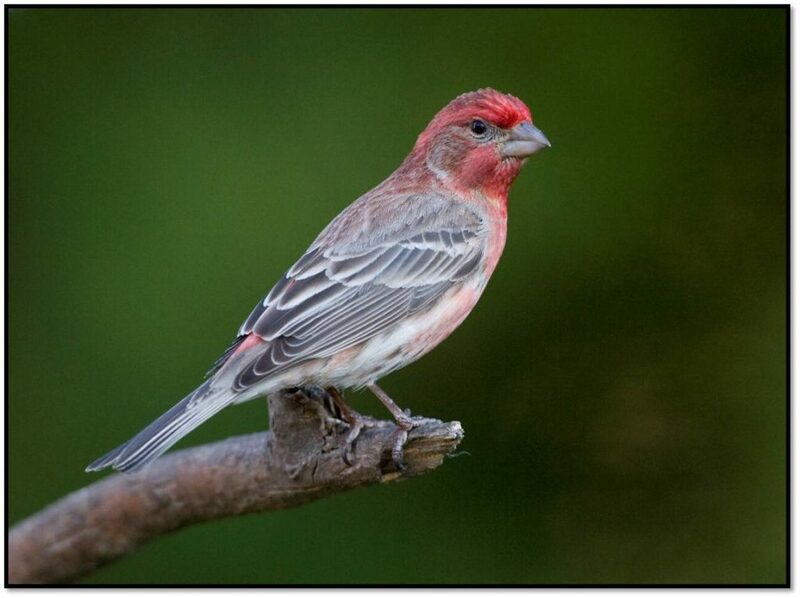 According to the book, Birds of Michigan, the first House Finch nest was found in Southfield, MI in July of 1981. House Finches are very adaptable when it comes to nesting, building in trees and shrubs near human habitation and, to the delight of many homeowners, even on door wreaths! Their nests are constructed of grass, twigs, leaves, hair and feathers. Leave plant material in the yard this spring instead of cleaning up, and place hair and feathers in suet baskets to help House Finches create their nests. Nesting begins in late March and can continue through August. The females lay 4-5 eggs which they incubate for 12-14 days. House Finches breed 2-3 times per breeding season. The young fledge from the nest approximately 9-11 days after hatching. 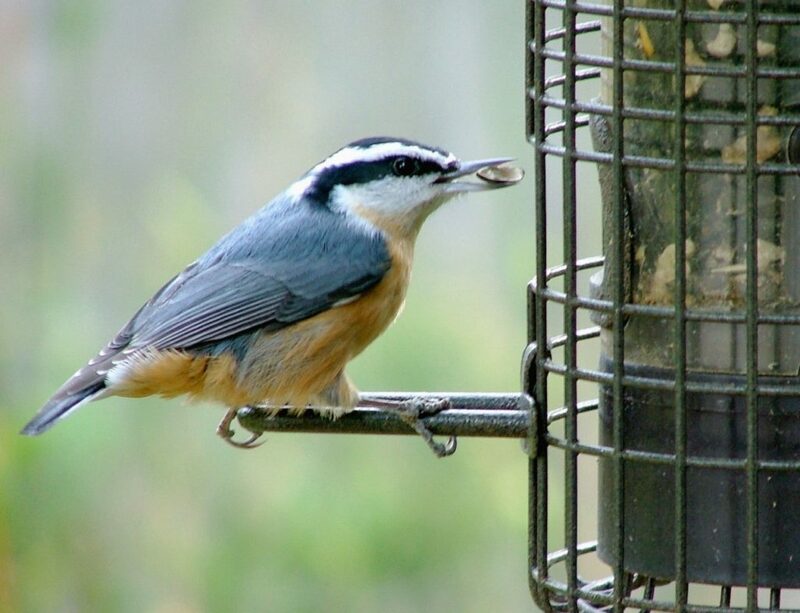 This is one of the few bird species that feeds their young only plant matter, as opposed to adding insects, a common food source for most fledglings. House Finches are frequent feeder birds; attract them by offering Sunflower Seed (either in or out of the shell). 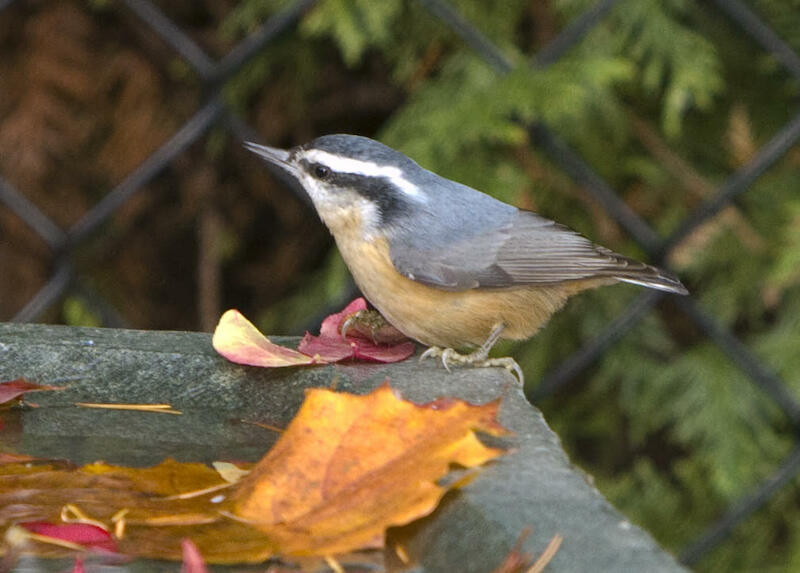 These birds are adaptable enough to also eat Safflower or Nyjer Seed (thistle). For some reason, this species is more prone to conjunctivitis than other species of birds – a good reminder to keep those feeders clean! Sterilize feeders using either vinegar (my personal preference) or a diluted bleach solution. 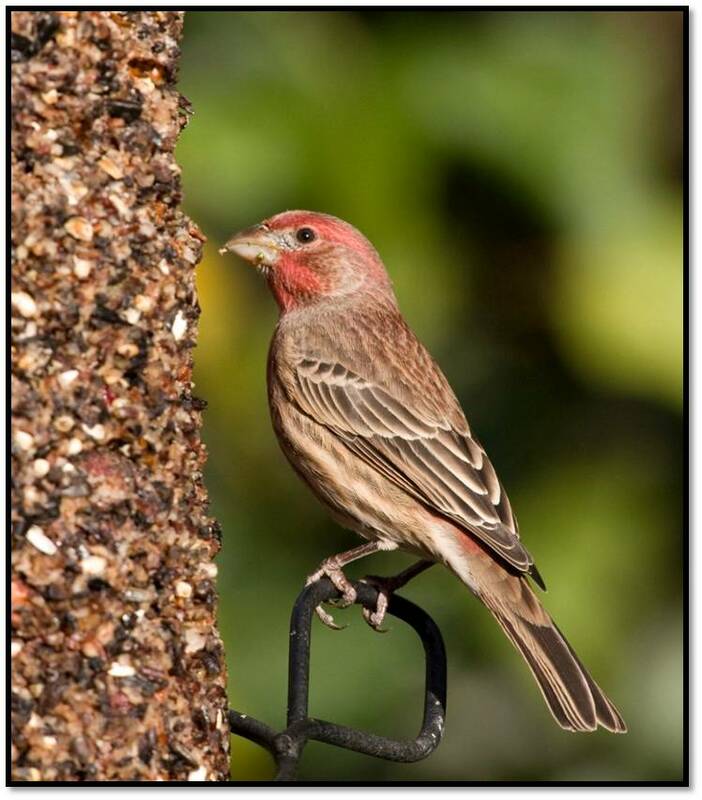 Rake areas under feeders (if offering seeds with shells) to prevent the spread of disease, especially since House Finches are known to feed from the ground. Better yet, use Sunflower Chips (sunflower out of the shell) and add a tray under your feeders so the area stays relatively mess-free. 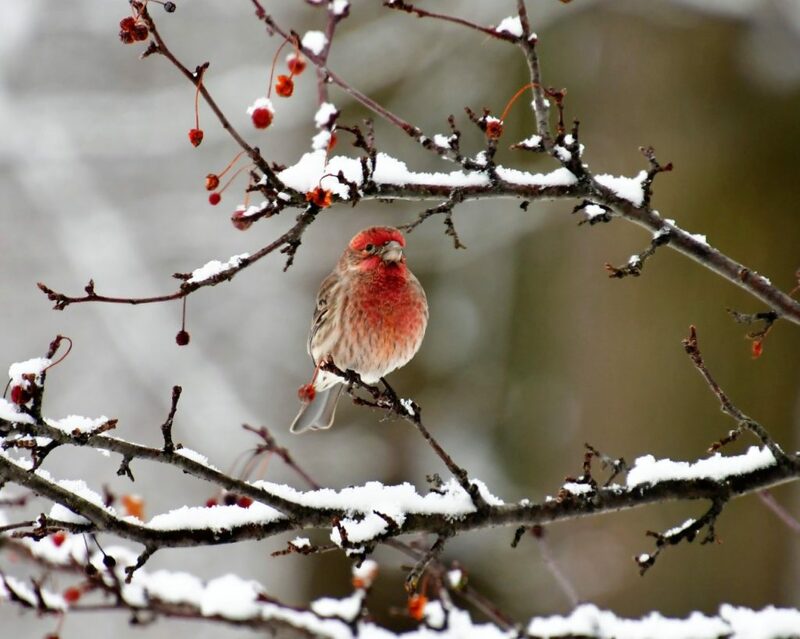 As the days get longer and the sunlight prompts territorial song, listen for the cheery, long song of House Finches, a welcome addition to any yard (click here to listen)! One of the moments I like most about late winter is hearing the Northern Cardinal beginning to sing. Prompted by the length of day, the Northern Cardinal sings to mark its territory. If we’re lucky, we can hear two male Cardinals calling in tandem in a hormonal duel. Unlike many other songbirds, the females also sing. Often in response to the song the male initiates, the female will sing from the nest. Many times, her song is longer and more complex than the male’s! During nesting season, this is her way of asking her mate for food, as she is the sole incubator and does not leave the nest. 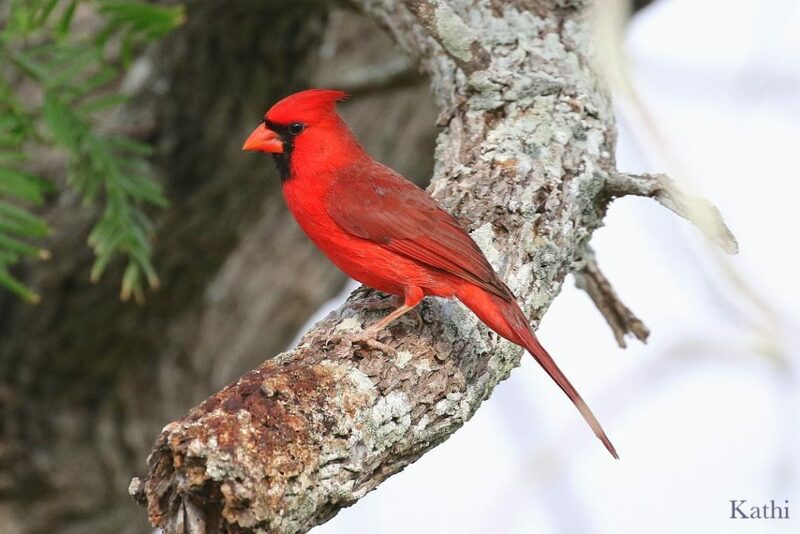 Cardinals have an amazing physiology within their syrinx which allows for their complex song. Click here for a link to recordings and explanations. 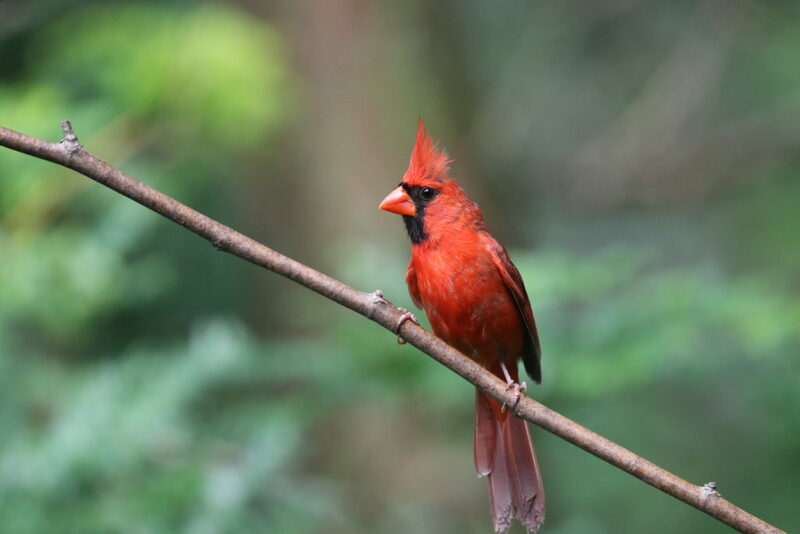 Northern Cardinals appeared in Michigan in the late 1800’s, expanding their range due to deforestation. 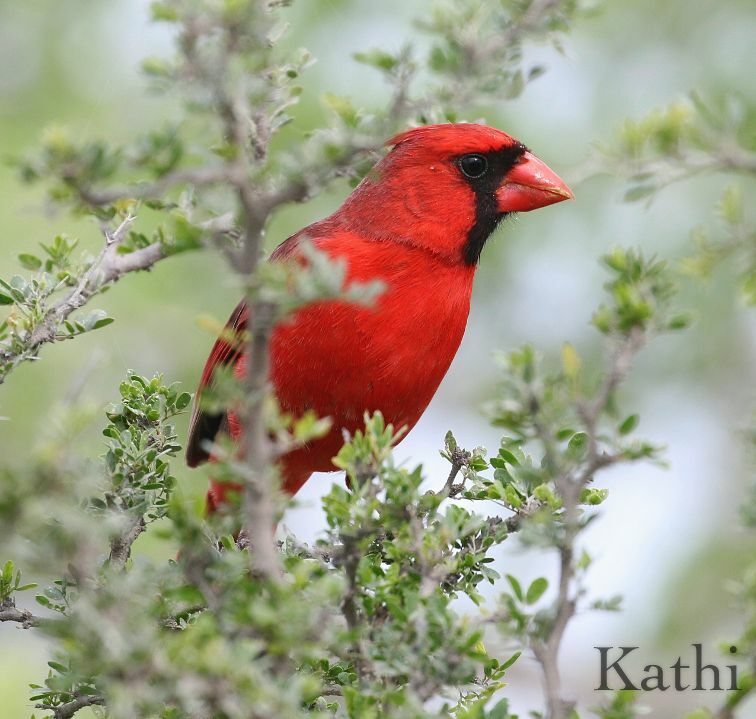 Cardinals prefer the opening of forest edges as well as low shrubs, so our yards make great habitat for these birds! 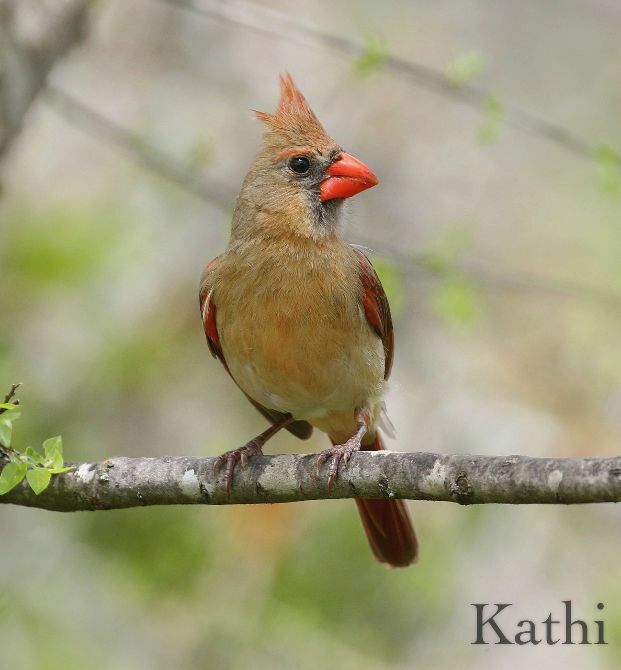 The female Cardinal is responsible for nest building. She bends twigs around her body and uses her feet to push them into a cup shape. 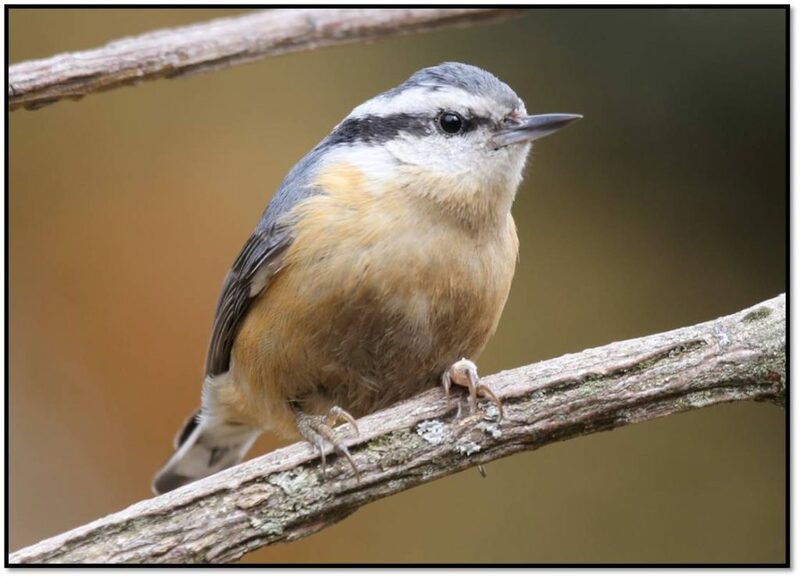 There are four layers to the nest including: coarse twigs, a mat of leaves, thin bark, and a soft top layer of grasses, rootlets and pine needles. In Michigan, Northern Cardinals start to nest in mid-April, laying 2 to 4 eggs. Incubation takes up to two weeks. After hatching, the young stay in the nest another few weeks fledging. The young are fed protein in the form of caterpillars and other soft-bodied insects. Adults are omnivorous, adding seeds and fruits to their diet of insects. These birds are named for their bright red plumage thought to be reminiscent of the cleric by that name. The have the distinctive honor of being the State Bird of no fewer than seven states, which is more than any other bird. Another endearing aspect of Cardinals is how the male feeds the female as part of courtship display. This is a change from their behavior in the winter, when it is every bird for itself. Juvenile Cardinals look like the females, a warm brown with golden overtones, and a lighter belly color, sporting red in their tail feathers, wings and crest. The difference between female Cardinals and the young is the females have a bright red beak, whereas young birds have a gray/black beak. The males have a prominent black facial mask larger and more striking than the females’. The beak is a distinctive characteristic in Northern Cardinals. It is very short and robust – a true seed cracking tool. The cardinal holds a seed in the beak, with a crunch down to crack the shell, then a roll of the tongue to rotate the seed until the shell falls away. This leaves the nut “meat” for the bird to consume. This method of eating allows the Cardinals to stay at feeders and eat. 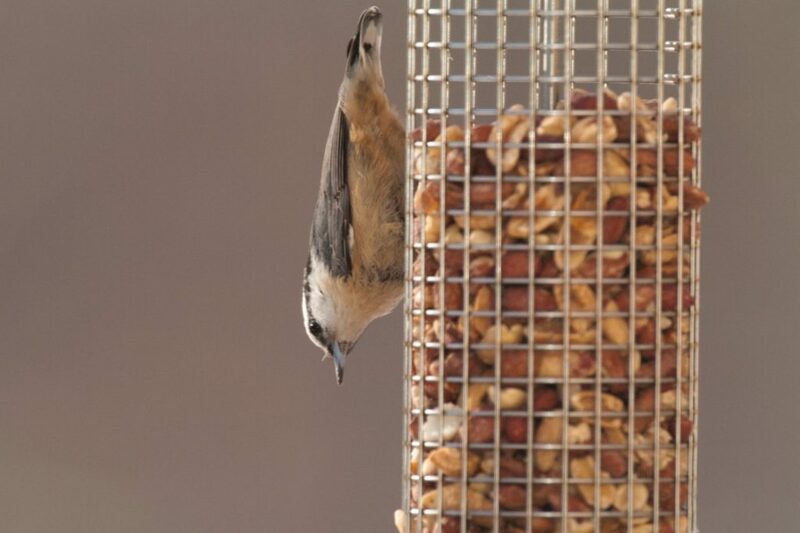 Other birds like Chickadees must instead fly off to a perch where they can hold the seed in their feet in order to extricate the edible portion of the seed. Northern Cardinals are one of the species of birds that are known to attack their reflection in a window or car mirror, repeatedly striking the surface, much to our frustration and dismay. This behavior takes place because the bird believes it is attacking another bird, an intruder in the nesting territory. In order to stop this behavior, block the birds’ reflection on the outside of the window. A product aptly named Stop Bird Attack is sprayed on the outside of the window, easily removed when no longer needed (this product sold at Wild Birds Unlimited in Grosse Pointe Woods). To attract Northern Cardinals, offer black oil sunflower either in or out of the shell, safflower and shelled peanuts. All of these seeds can be place in a hopper feeder with a larger ledge or a tube feeder with an added tray, essential for their body size if they are to reach the feeding ports. Take a listen for this beautiful songster, filling the days with sound that will lift your spirit.